HappyBuy Commercial Juice Dispenser has a stainless steel finish and comes with an 18-liter or 4.75 gallon size tank for dispensing a variety of cold and hot beverages. There is a R134/120g refrigerant, the hot power is 500 watts and the cold power is 150 watts (110V-120V and 50-60Hz). This commercial juice dispenser has a large capacity in each tank that will hold a lot of juice, and you can choose the single tank, two tank or three tank model. It is capable of producing cold and hot drinks and you can add yogurt, soy milk to add a bit of texture to your drinks. The cold juice dispenser has an environment and health protection PVC food-grade inner reservoir and a 304 stainless steel body. The water will not leak through the solid plastic spigot faucet that adds to the smart design of this unit. The juice dispenser is sturdy, durable and safe to use. It comes with a good quality, robust, durable and stable stainless steel evaporator. 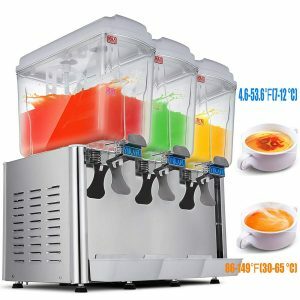 If the juice dispenser is used in an ambient temperature between 20 and 30 degrees Celsius, the cold temperature range is 45 to 54 degrees Fahrenheit (7-12°C) with the very efficient cooling system. And the hot temperature range is between 86 and 149 degrees (30-65 °C). The machine is quite easy to assemble and disassemble. You can use it in a variety of commercial settings with high demands including the restaurants, cafes, hotels, schools, convenience stores and more. It can dispense cold iced tea, fruit juice, lemonade and fruit punch, soda, coffee, tea, coke, milk, soybean milk, sherbet, cold beer or more for summer or winter. The condenser is all copper that ensures quick heat dissipation, ensures longer life, is very efficient and energy saver. There will be no leaking and no corrosion, but strong cooling. The juice is stirred evenly and quickly with the high power motor that makes it good for commercial settings. It doesn’t include the metal spouts but solid plastic spouts that you can replace with metal easily. 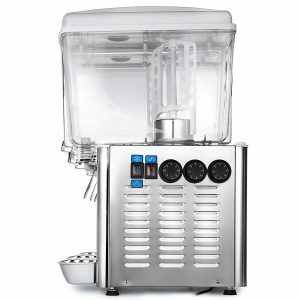 The single tank HappyBuy Commercial Juice Dispenser weighs 31 pounds and measures 9 x 17.5 x 28 inches, the two tank is 59 pounds and 18 x 17 x 28 inches and the three-tank dispenser is 86 pounds and 18 x 25 x 28 inches. It has a premium look and feel- is easy on the eyes. It works very smoothly and the stainless steel pouring valves do not leak, are easy to operate and maintain. These are the vertical spray dispensers with magnetic driven agitators- classic bubbler style. It shall take about an hour on average to cool down your drinks in these tanks. But this will depend on which region you’ll use them in. You can adjust the temperatures through the temp adjustment knob on the side depending on what you need. The drinks you have in these tanks should be between the minimum and maximum lines during use. If not the liquid may start freezing and the paddle may not be able to stir the drink. You’ll be able to juice much easier- with less effort than regular electric juicers that you can squeeze oranges or lemons in. It appears to be great value for the dollar.